Vocational Fashion students gained insight into the world of suit tailoring when they were visited by the owner of local menswear business, Astares. Students gathered in the South Downs Campus Library on 25 March to hear from Ruth McNamara about how men’s suits are made and the history behind male fashion. The students then had the opportunity to ask their own questions about suit tailoring and the comparison to female fashion. Ruth said: “I am one of the owners of Astares so I thought it would be beneficial to the students to hear about menswear and how to make a suit fit a man. 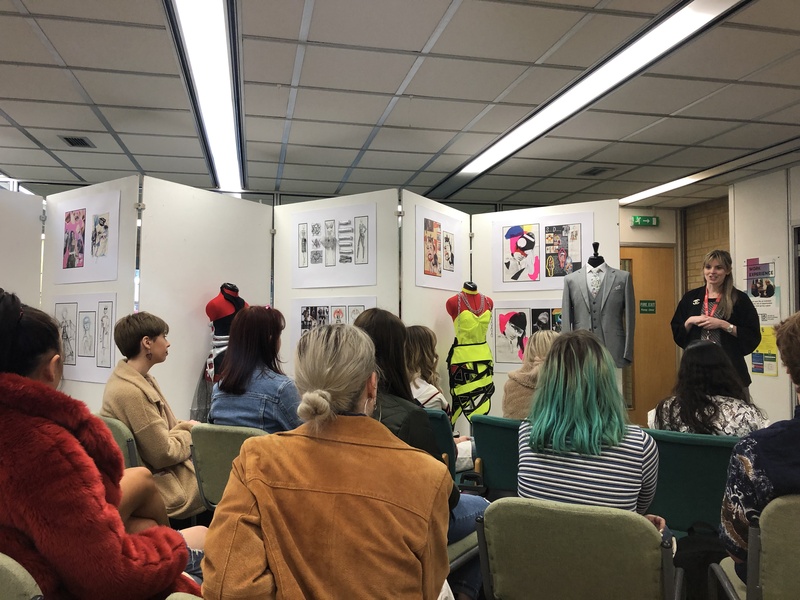 After the talk, Fashion lecturer Carla Saunders said: “It was a very interesting and engaging talk by Ruth, students said they really enjoyed it an learnt a lot about suits. The said they found out about things they had never even considered before, such as how different the male measurements are compared to the female. “The students always choose to design for women, so this was a real eye-opener and actually inspired the students to consider menswear in their future designs. The students also commented on how the talk made them realise that menswear and suits were much more interesting than they had originally thought, they felt more excitement about it and felt the talk showed them just how creative menswear could be. “They said it is always nice to hear from people in the industry as this inspires them to be more ambitious. Meeting professionals working in the industry makes it more of a reality and shows them that it is an achievable goal if they work hard and put the effort in. Click here for more information about Fashion courses at HSDC.